(1) What types of games are played at Games on Tap? Beer Bros. Gastropub is a pub venue with wide range of adult clientele. While certain notably offensive games (e.g. Cards Against Humanity, Personally Incorrect) are allowed for play, SaskGames ambassadors reserve the right to end any game that might be offensive, disturbing, and/or preventing another Games on Tap attendee from enjoying the event. First and foremost, we want to be inclusive and welcoming! (2) Who should attend a Games on Tap? Individuals aged 19 and over who enjoy playing games and enjoy the social interaction of gathering to play a game. These events encourage all levels of attendees, whether you have been playing board games for years or are just interested in learning more about the hobby. This is a non-competitive, friendly environment to come out and play. No. Games on Tap is a beginner friendly atmosphere. Newbies welcome! Even if you play board games often there are bound to be games you have never played before. Each game has a teacher who will be able to explain the rules. It is recommended that the game teacher have played the game before. If not it is a good idea to have done some research into how the game works beforehand to make the experience more enjoyable for everyone. This is a free event brought to you by SaskGames and Beer Bros. Gastropub. If you order food or beverages, please remember to pay your bill and support the waitstaff. You do not have to. This is a drop in style event and people come and go as they please picking up a game as they can when they get there. We ask that you post on the forum that you are planning to attend as that helps give Beer Bros. Gastropub an idea of attendance. Signing up for a game on the forum helps ensure you get to play the game you want. It also helps plan out your evening so you can get as much gaming in as you want. There are usually spur of the moment games that start up and when you get to Games on Tap you will see "Players Wanted" signs to help you get involved in a game. If you show up without signing up for a game there is a chance that all the games might be full or in progress and you might have to wait before a new game begins. Currently there is no lending library at Games on Tap. People bring their own games and you must ask their permission if you want to play it. The weekly ambassador can help you get into a game if you don't have anything scheduled. Ambassadors are the people that plan and bring you Games on Tap events. They help make Games on Tap inviting to new people. They will help you make a name tag and help you get started in a game. They also run the event so if you have any questions or problems let the ambassador know. We ask that you do not eat food in the game area. Consider that you are playing with someone's personal copy of a game and they likely don't want grease on their game pieces. There are designated dining areas for Games on Tap guests. A number of people will also arrive early at 5 pm and eat there before playing games. If it is your game and you don't mind people eating around it, you can host your game in the dining area with Beer Bros' permission. The name tags are for everyone's benefit. Lots of people attend Games on Tap and it is impossible to remember everyone's name. Being able to know people's names makes game play much more friendly. The name tags are also required by Beer Bros. Gastropub to help the staff serve us. Once you've made a name tag it will be stored in the binders at Games on Tap for you to use the next time you attend an event. Remember to put your name tag back in the binder before you go home. 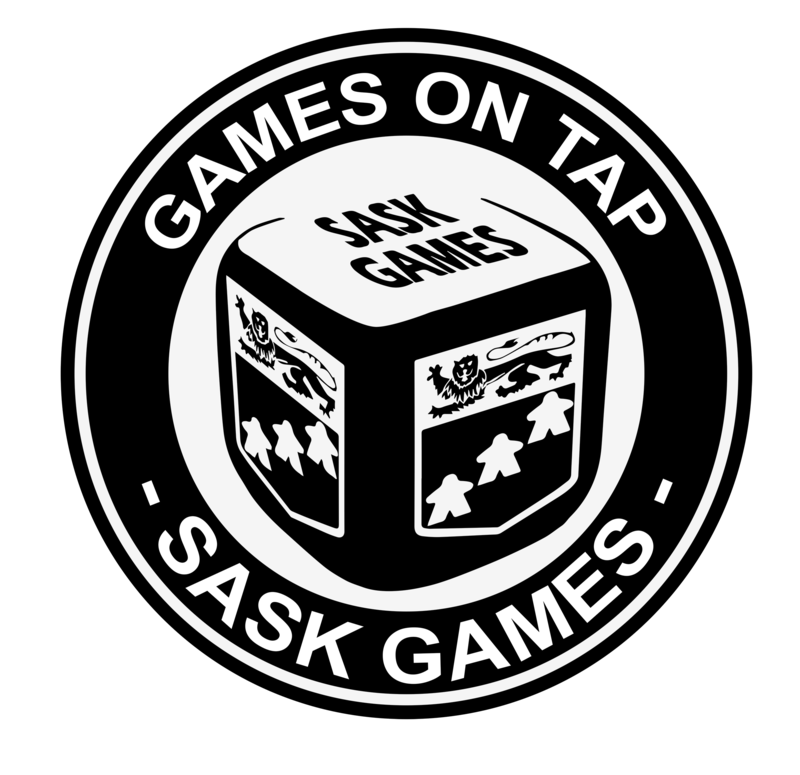 Games on Tap is brought to you as a partnership between Sask Games and Beer Bros. Gastropub. The Games on Tap series of events is part of an initiative to host a public weekly game night that is welcoming to new members and is a way for people new to boardgames to experience a beginner friendly atmosphere—an opportunity for people new to designer board games or veterans of the hobby to come out, meet ‘n’ greet, and play some games. This is held at a great location with full food and beverage service. Come on out and try some games. The style and types of games are as varied as the people who play them. This is an opportunity to play Designer Board Games, Wargames, Strategy Games, Card Games, and many other types. This is an initiative to help grow and strengthen the gaming community by creating a weekly public venue for gaming events. The SaskGames website was setup in August of 2010 and has seen steady growth in membership and activity. It is an umbrella site that works to connect various groups and individuals involved with the hobby. Games on Tap is an extension of the SaskGames values. "Life is Short; Play Games!" Beer Bros. Gastropub is a craft beer bar and gastropub in downtown Regina. They are pleased to support the boardgame community by providing a venue and hospitality for the "Games on Tap" event on Wednesdays. They have a great menu and a friendly atmosphere. Come on down to enjoy some Games on Tap. Games on Tap takes place every Wednesday with games officially starting at 6:30 pm and you can stay until midnight if you want. Feel free to come by early for supper beforehand. Full Beer Bros. Gastropub menu available. Please note that drinks are present in the gaming area. Saskgames and Beer Bros. cannot accept responsibility for loss or damage of property that is brought to Games on Tap. Parking downtown can sometimes be difficult, but there may be parking available along Scarth St or in spots on Victoria Ave. If not, parallel streets to these two in the downtown core will have street parking spots as well (note: City of Regina meters are enforced until 6:00pm on Wednesday nights).